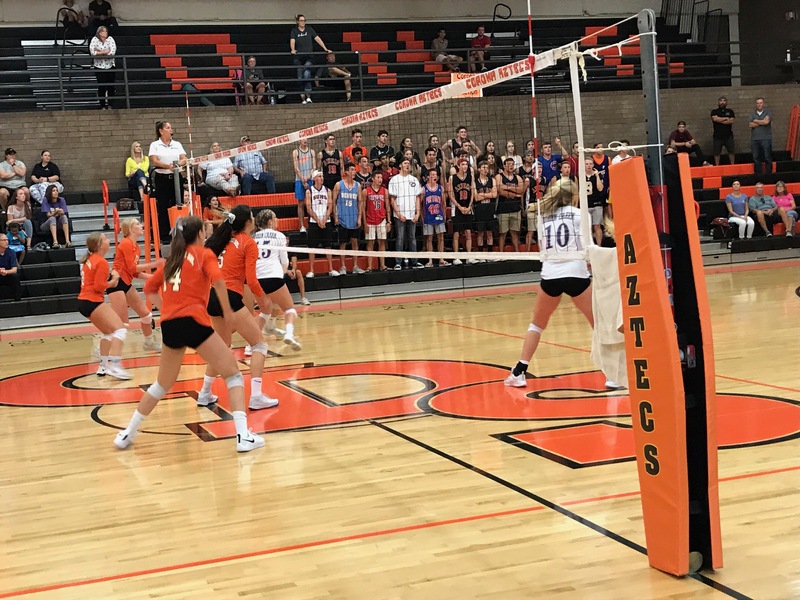 Corona del Sol is one of 34 teams competing this weekend at the annual Westwood Tournament of Champions Volleyball Invite at Westwood, Highland, Red Mountain and Skyline high schools. The Aztecs have won the tournament the last two years. (AzPreps365 photo). Volleyball competition is Friday and Saturday at the annual Westwood Tournament of Champions. Thirty-four teams are entered -- American Leadership-Gilbert, American Leadership-Queen Creek, Basha, Boulder Creek,Casteel, Centennial, Chandler, Cibola, Corona del Sol, Deer Valley, Desert Ridge, Dobson, Gilbert, Hamilton, Highland, Ironwood, Liberty, Marcos de Niza, Mesa, Marana Mountain View, Mesa Mountain View, Mountain Pointe, Mountain Ridge, Northwest Christian, Notre Dame Prep, Perry, Pinnacle, Prescott, Red Mountain, Saguaro, Shadow Ridge, Skyline, Sunnyslope and Westwood. Pool play Friday begins at 11 a.m. and continues through around 5 p.m. Pool A at Westwood HS - Corona del Sol, Basha, Notre Dame Prep, Deer Valley, Gilbert, Marana Mtn. View, Dobson, Westwood and American Leadership-Gilbert. Pool B at Highland HS -- Perry, Centennial, Highland, Desert Ridge, Pinnacle, Shadow Ridge, Mesa Mtn. View, Saguaro, American Leadership-Queen Creek. Pool C at Red Mountain HS -- Mountain Pointe, Sunnyslope, Boulder Creek, Chandler, Mountain Ridge, Red Mountan, Casteel, Prescott. Pool D at Skyline HS -- Hamilton, Mesa, Northwest Christian, Liberty, Skyline, Marcos de Niza, Ironwood, Cibola. Pools play continues Saturday morning with play beginnning at 9. Single-elimination bracket play begins at approximately 1 p.m. with the finals taking place somewhere between 4 and 5. Chandler High also entertains 43 schools at its annual Ojo Rojo Cross Country Invitational Saturday Sept. 15 at Tumbleweed Park. Tumbleweed Park is located at 2250 S. McQueen Road in Chandler. The event consists of six races. The schedule: 7:45 a.m. - freshman boys; 7:47 a.m. - freshman girls; 8:20 a.m. -- varsity girls; 8:55 a.m. - varsity boys; 9:30 a.m. - junior varsity boys and 9:32 a.m.- junior varsity girls. Chandler High hosts its annual Wolves Classic Invitational on the Chandler High campus. Swimming events will be contested Saturday Sept. 15 beginning at 8:30 a.m. At least 45 schools are entered. Psych sheets for the swimming events can be viewed at http://www.mychandlerschools.org//Domain/940. Diving was completed Tuesday and Wednesday this week.